Resides in San Cristobal, DR during the offseason...Participated in the Tigers Winter Caravan and TigerFest...Recommended/signed by Carlos Santana, Ramon Perez and Miguel Garcia for the Tigers. Spent most of the 2018 season with Double A Erie, pitching in 33 games, including 15 as a starter…also saw the first Major League action of his career, making nine appearances with the Tigers...Struck out a season-high 10 batters and threw 4.2 shutout innings in his season debut for Erie on April 6 at Reading...Allowed three runs-or-less in five consecutive starts from May 7-29, posting a 3.07 ERA (29.1IP/10ER) and 24 strikeouts...Made his Major League debut in the first game of the doubleheader on June 4 vs. New York (AL), throwing 4.1 no-hit innings with three walks and four strikeouts…became the first Tigers pitcher and the sixth Major League pitcher since at least 1908 to throw 4.1-or-more no-hit innings in his big league debut...Allowed the first runs of his Major League career on September 15 at Cleveland…began his big league career with 10.2 shutout innings, which was the longest streak by a Tigers pitcher since Andy Van Hekken began his career with 11.0 shutout innings from September 3-8, 2002...Pitched for the Mesa Solar Sox in the Arizona Fall League and posted a 2-1 record with a 9.82 ERA (11.0IP/12ER) and 14 strikeouts in 10 appearances. Made 19 starts between Single A Lakeland and Double A Erie in 2017...Sidelined from April 10-May 9 with a right oblique strain...Named Florida State League Pitcher of the Week for the week ending June 11 after throwing 6.0 shutout innings with one hit allowed, one walk and seven strikeouts on June 8 vs. St. Lucie...Struck out a season-high 11 batters on June 20 at Dunedin...equaled that total in his final start for Lakeland on August 18 vs. Daytona...Made four starts during June and compiled a 2-0 record with a 1.52 ERA (23.2IP/4ER) and 35 strikeouts. Spent the entire 2016 season with Single A West Michigan, starting 21 games...Posted a 7-9 record with a 3.81 ERA (113.1IP/48ER) and 88 strikeouts...Earned his first win of the season on May 17 vs. Bowling Green, throwing 7.0 shutout innings with two hits allowed, two walks and five strikeouts...Allowed two earned runs-or-less in four consecutive starts from May 17-June 5 -- had a 2-2 record with a 1.44 ERA (25.0IP/4ER) and 15 strikeouts over the four-start stretch... Pitched a season-high 8.0 innings on July 10 vs. Fort Wayne, giving up a run on five hits with six strikeouts... Sidelined from July 27-August 4 with a right shoulder strain...Made one start in the Midwest League playoffs and earned the win, allowing three runs on seven hits with three walks and eight strikeouts in 7.2 innings...Had his contract purchased by the Tigers on November 18. 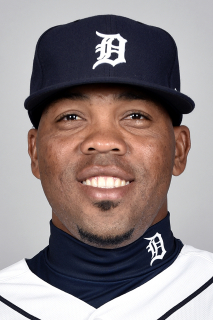 March 8, 2019 Detroit Tigers optioned RHP Sandy Baez to Toledo Mud Hens. September 1, 2018 Detroit Tigers recalled RHP Sandy Baez from Erie SeaWolves. June 5, 2018 Detroit Tigers optioned RHP Sandy Baez to Erie SeaWolves. June 4, 2018 Detroit Tigers recalled Sandy Baez from Erie SeaWolves. March 13, 2018 Detroit Tigers optioned RHP Sandy Baez to Erie SeaWolves. October 2, 2017 Detroit Tigers recalled Sandy Baez from Erie SeaWolves. August 28, 2017 RHP Sandy Baez assigned to Erie SeaWolves from Lakeland Flying Tigers. May 9, 2017 Lakeland Flying Tigers activated RHP Sandy Baez from the 7-day disabled list. April 10, 2017 Lakeland Flying Tigers placed RHP Sandy Baez on the 7-day disabled list. April 1, 2017 RHP Sandy Baez assigned to Lakeland Flying Tigers. March 20, 2017 Detroit Tigers optioned RHP Sandy Baez to Toledo Mud Hens. November 18, 2016 Detroit Tigers selected the contract of Sandy Baez from West Michigan Whitecaps. August 4, 2016 West Michigan Whitecaps activated RHP Sandy Baez from the 7-day disabled list. July 30, 2016 West Michigan Whitecaps placed RHP Sandy Baez on the 7-day disabled list. April 2, 2016 RHP Sandy Baez assigned to West Michigan Whitecaps from Connecticut Tigers. June 17, 2015 RHP Sandy Baez assigned to Connecticut Tigers from GCL Tigers. May 30, 2014 RHP Sandy Baez assigned to GCL Tigers from DSL Tigers. June 2, 2012 RHP Sandy Baez assigned to DSL Tigers. October 6, 2011 Detroit Tigers signed free agent RHP Sandy Baez to a minor league contract.